The best scale hard body on the market, very thick and highly detailed. 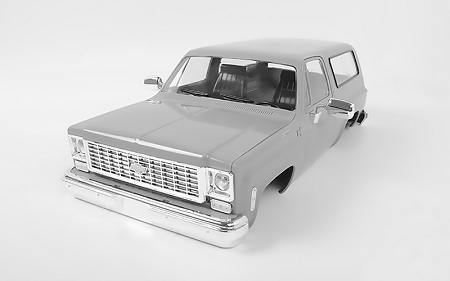 Comes with everything you need to make a great looking scale K5 Blazer. With functioning hood, tailgate and removable top the possibilities are endless. Easily mounts to a Tf2 with supplied mounts. You cant beat the price for what you get. The detail is second to none. Also the material is heavy duty and takes a good beating. I've had 2 and have yet to break or crack this. Well worth the buy. This body set is AMA-ZA-ZING! It's between the size of a clodbuster chevy body and the Vaterra one. More scale details in one package than anything else available. It's a good buy. The Blazer Body is a super detailed scale Body! I love the quality and all this little details on it!